There was a time not that long ago when it was deemed cool to have as small a mobile phone as possible. Tiny little flip phones, barely as tall and wide as a credit card, were all the rage as manufacturers competed to see who could make the smallest, lightest and most efficient handset. Nowadays, it seems that if you want a high-end smartphone, you have to be prepared to buy trousers with bigger pockets. The Samsung Galaxy S4 certainly falls into the pocket-stretching category, even if it is thinner than those old cell phones could ever hope to have been. Pleasingly, and despite having a larger display, that S4 is almost the same overall size as the Galaxy S3 at around 13.6cm tall and 7cm wide. It even beats it for thickness, knocking about 7mm off of the 8.6mm thickness of its predecessor. The designers seem to have moved away from the nature-inspired design of the S3 and given this phone a much more squared-off look. A brushed metal rim around the edge of the S4 gives it a slightly more upmarket look, but it still feels a bit flimsy, especially when compared to the metal body of the HTC One or the iPhone 5. All of the usual buttons are present along the sides of the phone, with the camera lens, LED flash and a small speaker on the back, but it's hard to shake the feeling that the S4, just like the S3 before it, feels a little bit cheap. Thankfully, the feeling of cheapness doesn't extend past the design of the body, and if it is pin-sharp images, vibrant colors and flicker-free video that you want, the S4 screen is certainly going to impress. The enormous 5-inch screen boasts the full HD resolution of 1920x1080 pixels, a big jump from the 720p display of the S3. The Super AMOLED display handles colors and blacks just as well as we have come to expect, even in bright sunlight. In some situations, the colors can seem a little too rich, but there are several ways you can adjust the display to your liking, including several pre-set color profiles. The size of the screen, combined with a fast processor, high resolution, and bold colors, makes the Galaxy S4 a dream for those who like to watch videos on the go. But even if only looking at photos, playing a game or reading text on a website, the HD display does stand up against anything comparable handsets can offer. The new software features are possibly where the most significant changes and improvements over the S3 have been made. There are so many cool, useful, and sometimes scarily smart tools included with this phone it makes you wonder how Samsung fit it all in (more on that in a moment). Notable additions to the S4 include WatchOn, a clever app which gives you the potential to connect your phone to your television service provider account, allowing you to scan channel listings and even control the TV. This is a little fiddly to get set up, and may not be available in all areas, but is very clever nonetheless. In addition to all the other Samsung apps found on the S3 (S Planner, S Memo, S Voice, etc.,) there is now a handy way to keep in shape with S Health. This app allows you to input your data and will then track your food and calorie intake. There is even a sports band available which can sync to the app and track your daily exercise. Another useful tool is the translator. This lets you speak into the phone and have your words translated into some different languages on the fly. It can also be used to record another language and translate it into English or another native language. Not only is this very easy and quick to use, but it is also incredibly accurate. The S4 ships with the latest version of Android Jelly Bean, but is guaranteed to be one of the first in the queue for the Key Lime Pie update due sometime in 2013. As it is, Jelly Bean is easily the best version of Android so far, and the Samsung TouchWiz interface does nothing to detract from this. There are dozens of settings and options to play around with on the S4, but they are all logically organized and often include pop-up instructions when viewed for the first time. The S4 is undoubtedly a sophisticated and advanced smartphone, but it is one which doesn't assume a certain level of user knowledge. At the time of writing, the 13-megapixel camera in the Galaxy S4 is just about the highest resolution camera found on any phone. It is a big jump from the already extremely nice 8-megapixel camera found in the S3, and a massive leap over the paltry 4MP of the HTC One. Of course, pixels aren't everything, and the S4 also has clever software for photography. While Burst Mode and HDR mode help you to grab the best pictures possible, new additions such as Dual Shot and Sound & Shot add fun to your photos. Dual Shot lets you take a photo with the main camera and then superimpose your face over the top of it, while Sound & Shot enables you to attach a short audio clip to a photo, which then plays when the picture is viewed. There are several other clever effects tools at your disposal, including Animated Photo and Best Face, but one of the most useful is the Optical Reader. This camera app can recognize text in an image, translate it, store it for later or even recognize it as a contact and save it to the contacts app. 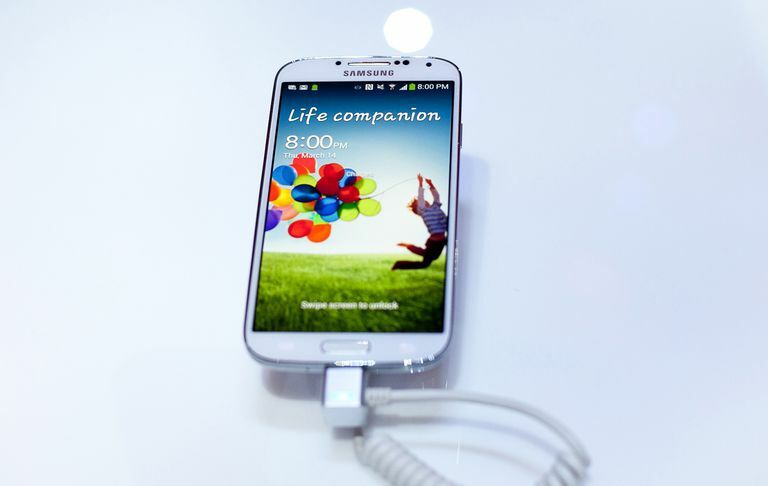 When it comes to the CPU, there are two different versions of the Galaxy S4 available, depending on where you live. North American users have the option of both a quad-core CPU and a mind-boggling Octa-core (yes, that's eight cores) version. The S4 I had to play with was the 1.9 GHz quad-core, and it handled every performance test with ease. I can't see the octa-core version adding much, as all eight cores could never actually be used at once, but if I ever get my hands on one, I’ll be sure to try them out side-by-side. It would be interesting to see what effect the extra cores have on the battery life, which is far from awe-inspiring on the less powerful model. Aside from the short battery life, another slight disappointment with the S4 is the storage capacity. While there are 16, 32 and 64GB versions available, the sheer amount of pre-installed software can take up as much as 8GB of that space, leaving some consumers feeling a bit cheated. There is, of course, the option to add a MicroSD card to the phone, but this doesn't help with apps, which can no longer be moved to SD. On top of that, the 32 and 64GB versions of the phone don't seem to be as available as the 16GB. Hopefully, that will change soon because 8GB of storage is often just not enough these days. Again, Samsung has produced a market leading smartphone. It may seem to some to be more like the Galaxy S3.1 than a full update, but for those who give it the time, learn what it can do and take advantage of the advanced features, it is hard to beat. The 5in screen is fantastic, the camera is both powerful and great fun, and the whole package feels well thought out. The slightly cheap feel does let the phone down somewhat, but the choice of materials almost certainly reflects in the price (as well as the weight) of the S4. Grab a Samsung Galaxy Note 9 and Get Your Game On!